Welcome to iFamilyKC: KC parents' guide to Kids Eat Free, Things to Do & Everything in between for Kansas City kids. 1. Online Calendar – Find fun, educational, and/or FREE things to do with our online calendar! You can also add your own events if you have a community event or activity coming up. 2. Weekend Planner Email – Each Thursday, our event expert Jenn rounds up the fun events & activities happening in KC. Explore family-friendly events, festivals, activities, classes & programs, & other fun ideas of things to do. Get The Scoop! 3. Head to the Blog – No...we aren't gushing about the drama in our lives. KC guide posts help you find everything from 81+ Christmas Lights to all pools in town (Indoor & Outdoor). Our Favorite Guide Posts: After School Activities Guide, Christmas Light Guide, Summer Camps Guide, and Field Trip/ Educational Activities Guide. Find the best deals, discounts, & things to do in KC. Click the "Follow" button, to seeus 1st – we promise it's worth it. You can also join our Facebook Community Group to stay connected! Recognized as one of the Top 50 Influencers in Kansas City! After a decade in the corporate world, & several years as a stay-at-home mom of 3, Shawna Allen created iFamilyKC & iPetsKC to connect her community with top-notch kids resources, things to do and deals. As a Kansas City native, mom and lifelong pet lover, she knows what KC parents & pet owners need. In the last 16 years, we've become the leading source for all things kids in KC. That's the most important aspect of what we do...helping KC parents like you! Things to do in Kansas City...& more Family Fun! Find places kids eat free (or really cheap) in Kansas City, the best camps & classes, family events, things to do this weekend, fun activities for kids, field trip destinations, coupons & discounts, and so much more. If you're looking to save money, you've come to the right place. Be sure to visit our Enter to Win page for your chance at the best Kansas City prizes! Also check out our blog for great resources like our Summer Fun Guide, parenting advice, things to do year round, Kansas City farmer's markets, place to fish, camp, or hike...if it is in Kansas City, we've got the scoop! Find the best of Kansas City in every category. Get reccomendations from our readers about their favorite places to eat, shop, play, and learn, as well as services, vendors, and activities. Visit our Kansas City events calendar for hundreds of fun (often free) family friendly events, activities, camps & classes, and more for kids in Kansas City! 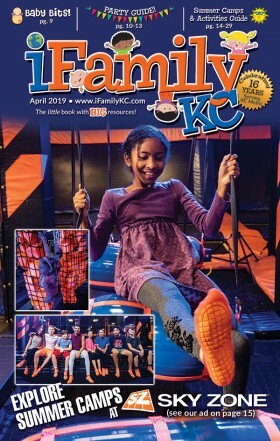 Be sure to sign up for our eNews list with the "Sign Up" button above to get the scoop on all things "kid & family" in the Kansas City Metro area! You will receive exclusive invitations, COUPONS, freebies, enter2WIN opportunities, event announcements & more! Looking for extra ways to earn money...easily? Check out our latest tips on Better Kansas City with KCTV5. Main Event presents Monday Night Madness! Open Swim - Emler Swim School of Leawood's 5 Year Anniversary Celebration! Scholastic Book Fair Warehouse Sale is Coming to KC: Save BIG $$$!